Bavière et volcan welcomes you in an ample property right in Villié-Morgon village (shops within short walking distance). Our typical Beaujolais-style holiday home is a delightful self-catering accomodation on 3 levels. The charming cottage is customized with Bavarian ambiance & volcanic touches reflecting story & hobby of the German-French couple runing that lovely place. 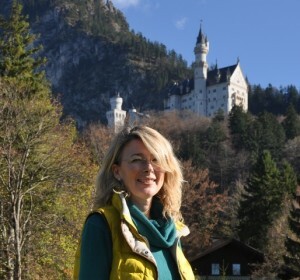 Andrea has just left her Bavaria birthplace region so as to realise her dream: to welcome visitors in an authentic and personalised guesthouse and B&B structure. 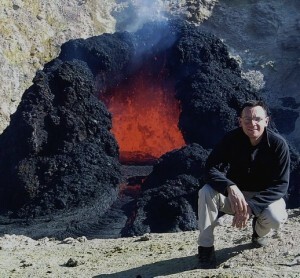 Emmanuel helps to give birth to the project while keeping an open eye on volcano activities. We met on a volcanic island. Since, when one is German and the other one French, living 800km far away, it was not easy to build a common life. United with travel passion we decided to land in a magical place so as to live together and to build a place reflecting us. Bavière et volcan holidayhouse with character and guesthouse with charm in the region Beaujolais is located in Villié-Morgon, in the heart of the “Beaujolais-Cru” region rich with passionated winegrowers. You can explore a picturesque surrounding with wine fields and wine villages. Also the cities Mâcon (20 km) and Lyon (50 km) are quickly accessible. The house Bavière et volcan has lot of character and personality. She has been built ca. 150 years ago in “pisé” (rammed earth) an old craftsman-technic. At this time the natural elements (sand, loam and gravel) from the surroundig were used. Years later the house was extended with a second wind, in a typical Beaujolais-architecture. The holidayhouse is suitable for guests which like to supply themselves and want to live their holidays by own wishes. It has a separate entrance and offers independence and privacy. For more confort, optional services are available on request (breakfasts, …). The large garden with old trees, is opened to the guests and is very attractive. The gigantic old cedar beside the tower is imposing and you will be catched by its dimensions. The tower shelters a guestroom (B&B) and is designed for couples which like to spend nice days and romantic evenings, breakfast service included. Private covered parking next to the tower. The tower offers a remarkable wooden roof beam fully apparent and toping your confortable bed. Within a short-walk (5-minutes, no car needed), Villié-Morgon village presents all services: a delicious bakery, 2 high-quality butchers, a book-shops and a small supermarket. Thursday is the day of the local market. Of course, like every villages of the “10-crus” Beaujolais, Villié-Morgon has its own city wine cellar (caveau) + dozens of personal wine cellars open to the public. Doctors and dentists also in the village.